INDIALAW has handled several commercial arbitrations for a host of corporate majors by creating specialized mechanism for handling regular commercial arbitrations to achieve time bound and faster dispute resolution obviating procedural delays in the civil litigation. They have developed an innovative mechanism for execution of Arbitral Awards and has successfully handled more than 6000 execution proceedings in 200 districts across the country. Firms professionally managed service has resulted in a loyal clientele to the Firm and today INDIALAW advises and lends services to more than 100 leading corporates. Under his guidance and leadership, INDIALAW has grown into a preferred law firm representing for several corporate giants. He has been instrumental in creating a Pan Indian network to provide “One Stop” legal service to handle all types of legal issues of corporates. Under his focused guidance, INDIALAW has established its presence in more than 400 districts making INDIALAW a PAN India legal network. The enormous legal network is coordinated through more than ten offices located in strategic locations in the country headed and integrated through efficient use of technology. LiveLaw: INDIALAW holds the distinction of being the Largest Legal Network in the country, offering “One Stop” legal services in various branches of law. How and where did the expedition begin? K.P. Sreejith :During my interactions with the corporates, I realized that corporates really struggle to manage their legal works at district level. The biggest challenge for them was identifying a competent and responsive lawyer. It is really hard to find such a lawyers at the district level as most of the lawyers follow traditional legal practice which is highly unorganized, not very proactive, lack of giving timely update, executing the work on time. In effect, for a corporate, their nightmare starts once they assign a work to a local level lawyer, starting with constant follow ups, guiding, reminders etc to ensure proper handling of the work. In my experience, majority of the lawyers are reactive not proactive and do not take ownership of the work assigned to them. In spite of paying the fee, the client has to constantly follow up and remind the lawyers to do the job which they are supposed to do. Corporates require timely update of the matters, regular MIS, etc. but many of the local level lawyers are not good in technology and do not even use emails. Therefore, I realized that a professionally managed Pan India network providing one stop legal service has tremendous potential but it was really challenging considering the current system and mindset of the lawyers. Many of my lawyer colleagues used to laugh at me saying it is an impossible task! Pan India network stared in the year 2009 starting from Andhra Pradesh, then moving to Kerala, Karnataka, Tamil Nadu, Maharashtra and Gujarat in the same year. We identified lawyers in each district and organized state level training sessions to bring them in line with the Firm’ s standard and quality .The network is managed with the use of technology and professionals with management expertise. INDIALAW has developed software during year 2004 and today entire organization is managed though ERP which provides real time updates of matters to the clients. LiveLaw: INDIALAW has been growing at a rapid pace. What are the main practice areas? What are the future plans for expansion ? K.P. Sreejith :We have achieved a tremendous growth both in terms of talent acquisition and our geographical reach. Currently, there are ten partners and they bring with them years of experience in their own areas of specialization. We have created a team of lawyers specializing in different practice verticals under them. Currently, about 100 lawyers are working with the Firm and many them are recruited from premier law schools. INDIALAW specializes on 38 practice areas which includes Litigation, Arbitration, Execution, Corporate, Regulatory, Compliance, IP Enforcement, Real Estate, Due Diligences etc. Each vertical is headed and managed by experienced team from the respective practice area which helps improve the specialization and quality. Currently, INDIALAW has offices in all state capitals in South India in addition to the other offices in Mumbai, Delhi and KolkataINDIALAW plans to set up offices in the rest of the major state capital by end of 2015 and plans to connect with all the districts in the country by 2016. LiveLaw:With 12 Offices and providing services in more than 400 Districts, what are the administrative challenges involved in such an elaborate set-up and how do you overcome them? K.P. Sreejith :Managing multiple offices and huge network is the biggest challenge. We created the entire organization like a professionally managed corporate organization. Entire organization is structured on a professional platform considering the future growth plan along with extensive use of technology. INDIALAW is a professionally managed organization where the administration work in handled by experienced professionals who have experience in management. . Operations are managed strictly on process and we have standard operating procedures (SOPs), which help us to ensure synchronization and timely execution of the assignments. LiveLaw:The firm has pioneered a client service team to provide timely, flawless, cost effective and quality services to its national and international clients. What is the functioning the Client Service Team? K.P. Sreejith :The biggest to challenge to a law firm or lawyer is to execute the work on time and provide regular updates to the client. This requires the lawyer to handle lots of administrative / managerial work besides legal work. A litigating lawyer often ends up spending most of the day in the Court and very little time is left for him to finish rest of his work. During the court hours, client faces difficulty to contact lawyer in case of urgency. Therefore, we introduced the client service team who manages entire administrative responsibilities and ensures execution of the work on time. Each client is assigned with Client Service Manager who acts as a channel between the lawyer and client to ensure flawless execution of the work. LiveLaw: INDIALAW has already adopted Enterprise Resource Planning, which is still being viewed as the future infrastructure of large Law Firms. Kindly elaborate on the importance of ERP system with special emphasis on Law Firms. K.P. Sreejith :We believe technology is the future and hence, we always adopt the latest technologies to manage the organization. We use a customized ERP well equipped to handle large volume of matters. ERP helps to utilize optimum use of resources, effective handling of assignments, real time updates, planning etc. It would be very difficult to manage an organization like us without ERP and latest technology. In addition, the Firm also provides Client Access Portal which helps the Client to access the interface and understand the progress of the matter at every stage. LiveLaw: INDIALAW is making its presence felt in the international arena as well. What are the future plans of expansion? K.P. 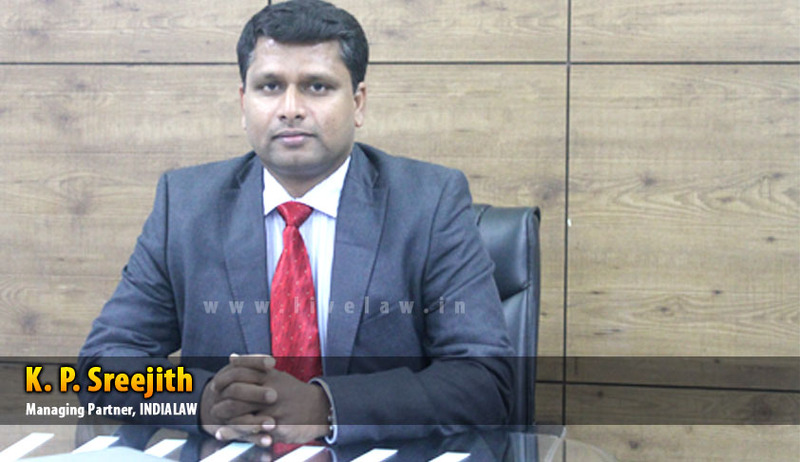 Sreejith :INDIALAW has opened its first overseas office in Dubai in March with primary focus to provide cross-border services to Corporates and also to provide legal support to NRIs in all areas viz. investments, transactions , litigations etc.we find that many o the NRIs are keen to investment in India but our multiple regulatory approvals, compliance etc are the major hurdles which they are unable to mange being in abroad. Therefore, we intend to provide complete support in the legal and regulatory areas across India to NRIs. INDIALAW is exploring the possibility to set up office in other Middle East countries as well. We also have associate offices in UK and Japan. LiveLaw:What is the system of administration that is adopted in these international offices? Is it analogous to the structure in India, or a different scheme altogether? K.P. Sreejith :All offices function as per the standard operating process of INDIALAW with required modification and also integrated with ERP. State Head quarters and districts are connected with centralized Pan India Head Quarter at Navi Mumbai with massive IT hub. Therefore, entire administration fully atomized process to ensure seamless execution of the assignments across all the locations. LiveLaw: Today independent practicing lawyers and even retired judges encourage Alternate Dispute Resolution Mechanism (ADR) and are competing with corporate law firms to take up such matters. Individual lawyers have also stepped into the realm of international commercial arbitration. Do you think this is a setback to the practice of big corporate firms? K.P. Sreejith :Most of the big corporate the law firms are city centric. The in-house lawyers in corporate are really handicapped when it comes to matters, both litigation and no-litigation, in tier II and tier III cities and districts. Corporate law firms are not equipped to handle mattersparticularly in these location. As a result, the corporates have to depend upon the individual lawyers who are not accustomed with the corporate style of functioning. Ensuring the quality of these lawyers also a big challenge to corporate. We are trying to bridge this gap by constantly training the lawyers associated with us in all these districts. As far asl possible we also try to standardize the pleadings and procedures across locations based on best practices and experiences. For instance, when we started execution proceedings we realized most of the courts follow their own formats that too long sheets flied by hand. Therefore, we created standard application and instructed our lawyers to convince he court and file the application that format. Today, in more than 200 courts, our associates use the format created by us for filing Execution petition moving from the traditional practice. We also created process note guiding the lawyers to conduct the entire execution process expeditiously. Thus, to certain extend, we believe that this will help to improve the quality of legal system at districts and small cities. .
LiveLaw:The Pro Bono Legal Workshop organized by you in August last year, co-hosted with iProbono, the Confederation of Indian Industry and Hewlett-Packard was the first of its kind in India. Whose brainchild was the idea and are there more such events to follow? K.P. Sreejith :We are focusing on number of pro-bono activities. We are committed to improve the quality of legal profession in India especially at lower courts. We frequently conduct various training programs for the lower court lawyers. Last years, we have actively participated in iProbono workshop conducted in Delhi. Our Sr. Partner P.V. Dinesh received a request/invite from HP (one of the sponsors) which we happily accepted. Dinesh actively supported and participated in the event. We are planning more such events in this financial years. LiveLaw:How are the Corporates being benefitted from the Firm’s Pan India Operations? K.P. Sreejith :We have more than 100 leadings corporates in our client list both domestic and international, which includes several TATA Group Companies, HUL, Burger King, HP, Standard Chartered Bank, Vodafone,FedEx, Nike, Siemens, L &T etc.Johnson & Johnson, Glaxo Smithkline, etc. which itself is a clear indication of the satisfaction of our clients.